The mission of Kenowa Hills Youth Football (KHYF) is to provide an organized football program that fosters the players’ appreciation of the game in a competitive team environment. Players develop mental and physical abilities through a commitment to structured practices. The KHYF goal is to teach sportsmanship, fundamentals, teamwork, skills and knowledge that players will use throughout their lives. 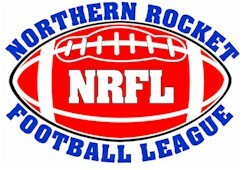 The Knights of Kenowa Hills are members of the Northern Rocket Football League (NRFL). The NRFL is made up of 29 areas in the counties of Kent, Ottawa, Montcalm, Mecosta, Osceola, Isabella, Lake, and Ionia. In 2010, over 8,500 boys participated in Rocket Football and Flag Football. KHYF also is a member of the Middle School Big Ten League (MSBTL), this is the league for our 8th graders. Operations of Kenowa Hills Youth Football are directed by an administrative board composed of the 5 officer positions. KHYF also has 4 age group representatives. All team head coaches may also be asked to vote under certain circumstances. The Kenowa Hills Youth Football program is self-funded through program fees and fundraising events. Player participation fees may cover the cost of: player jerseys, coaches’ shirts, player T-shirts, concessions staff, team football equipment, league affiliation fees, field maintance, game day officials and other operational expenses. Tackle football is divided into 2 playing levels by grade. The number of teams fielded will vary based on the number of players enrolled at each division. The chart below will help illustrate the basic differences among the levels of play. The league oversees a computer draft that helps to fairly select players, based on age, experience and weight. Because of this draft process we have NO control of placing players with friends, neighbors, schoolmates, relatives, etc. The only exception is siblings playing at the same age level will be placed on the same team by the league. Also coaches' children will be placed on their team. Flag football has its own section on the website here. 3rd/4th: Every player should start on either offense or defense and play as equal time as possible. Players are required to attend practice and be ready to play on game day. Team size is targeted at 15-18 players depending on the number of coaches available. 5th/6th: Every player should start on either offense or defense or special teams. Players are required to attend practice and be ready to play on game day. Team size is targeted at 15-18 players depending on the number of coaches available. Playing time is determined by the coaching staff, the above suggestions are guidelines and coaches are encouraged to utilize these guidelines. Coaches are selected by the administrative board. Volunteer coaches are solicited during the sign up process. One head coach and two assistant coaches are desired per team. Team size is dictated by the number of available qualified coaches. All coaches are given a background check and photo ID cards by the NRFL. KHYF provides coaches training via camps, clinics and professional coaching seminars when available. One of the primary objectives of this program is to instill the responsibility of being a member of a team. Attendance at practice is critical for the safety and well-being of each player and affects the morale of the team. Football is a highly organized, building block sport, which requires thought, timing and coordination among 11 participants during each play. Missing practice may mean missing important fundamentals. It is our experience that players that miss too many practices, regardless of their skill levels are more easily confused in a game situation. This confusion sometimes distracts from the enjoyment of the game and perhaps jeopardizes the player’s safety. At no time will a coach play an individual who he/she thinks is not appropriately prepared to participate. Coaches take a great deal of time to organize practices. Each minute of practice is planned so that every player has a maximum amount of participation. A coach must know how many players will attend to plan the best drills, exercises, instruction and scrimmage. It is inconsiderate to the coaches to neglect to tell them in advance about the limitations in a player’s practice schedule. When a player knows that he is going to be absent, it is his responsibility to notify their coach in advance. Players with unexcused absences can expect reduced playing time. For your child’s safety , be sure to have all equipment properly fitted by a qualified person. Game jerseys are NOT to be worn to practice unless you are specified to do so by a coach. .
Practices are held weeknights and are scheduled at the discretion of the Head Coach. NRFL allows 3 “contact” events weekly, so generally that is 2 full contact practices and one game each week. Coaches often will have a 3rd practice, without pads. Please pick up your child on time! It is unfair to coaches who already donate so much of their time to wait for a player to be picked up after practice. Games are scheduled for Saturdays, starting as early as 8:00am and may be as late as 8:00pm. The weekly game schedule is usually posted to the website by Wednesday. KHYF has no control whether a team plays home or away, or the time of the game. Games are scheduled on a strength basis utilizing a computer program created specifically for the NRFL. The goal is to match up teams evenly as the season progresses. Players should assume practice would be held regardless of the weather conditions unless a coach contacts them or posts a notice on a predetermined website. It is the parents and players responsibility to ensure that players are dressed appropriately for weather conditions. Game day cancellation due to weather or field conditions will be posted on the website as soon as a decision is made. Our desire is to assess each game based on its scheduled start time and the weather and field conditions at that time. Each head coach will have a Parent's Meeting prior to the season’s first game. Please arrange your schedule to attend this important meeting! This meeting provides for an open discussion on program philosophy, and coach expectations. Please remember that coaches are unpaid volunteers. They are on the field with the desire to help teach your child the game of football. Coaches devote much of their personal time as volunteers. They deserve your respect and can always use some encouragement! Did you discuss the issue with your player first? Players often understand why coaches have taken a certain position, which may not be obvious to you. Try not to discuss your issue before practice, as this is generally a very distracting time for the coach. After practice is preferable, after players are off the field. We encourage you to call coaches to discuss your concern. Please avoid talking to coaches in front of other players. Before and after games is not a good time to express your thoughts, as emotions are generally high. Please wait at least 24 hours to contact the coach. If you have tried speaking with a coach, or are uncomfortable doing so please contact the administrative board president. Coaches need to know what is happening with every player. Events in a young player’s life will often manifest themselves on the field. Problems at home or school can affect play and sometimes your child’s ability to effectively interact with his teammates and coaches. Often times we as coaches can help. Coaches care about your children! We sincerely believe that Youth Football is a tremendous outlet for building self esteem and learning valuable life skills. The experience and knowledge learned in this program can assist your child in being successful in whatever endeavors they choose in life.